Here is a great master scone recipe that I use at Star of Texas Bed and Breakfast, you can make into sweet or savory scones. It’s easy to make ahead and keep in the refrigerator then roll out and cut. Place 4 c flour, salt and baking powder into the bowl of a mixer and process with a paddle attachment until mixed thoroughly. Add butter and mix until butter is pea sized. In another bowl mix eggs and cream thoroughly. Pour into running mixer until all ingredients are just combined. Stop mixer, dump onto a floured surface: knead until well combined. 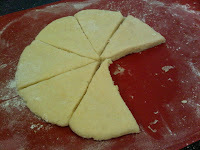 Shape dough into a round. 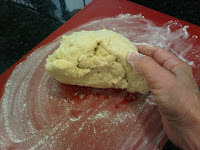 Use a rolling pin to roll dough out 3/4″ thick. 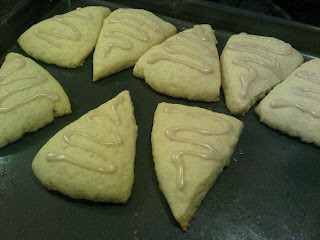 Cut into whatever shape you like or use a cookie cutter. Place individual scones out on a parchment papered cookie tray. Mix egg and brush on top of scones. Sprinkle sugar on sweet scones. Place in oven and bake up to 25 minutes or until scones are a golden brown and crisp on the outside. Makes 8 to 12 large scones, or cut into smaller ones. You can add any flavors you want, vanilla bean or pumpkin and make an easy glaze from powder sugar, milk and spice if you like to drizzle over them. enjoy!